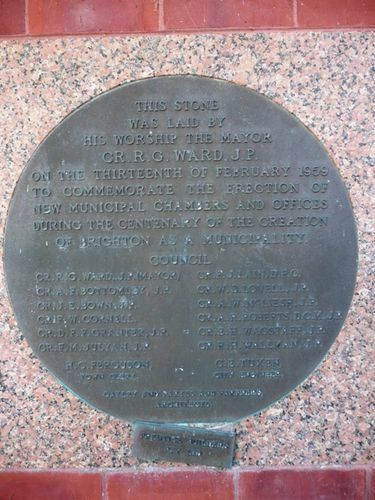 Plaque commemorates the erection of the new Municipal Chambers during the centenary year of the Brighton Municipality. This stone was laid by His Worship the Mayor Cr. R. C. Ward, J.P. on the thirteenth of February 1959 to commemorate the erection of new Municipal Chambers and offices during the centenary of the creation of Brighton as a municipality. Cr. R. G. Ward (Mayor) Cr. F. J. Lain, D.F.C. Cr. A. F. Bottomley, J.P. Cr. W. B. Lovell, J.P.
Cr. J. E. Bown, J.P. Cr. A. R. Roberts, D.C.M., J.P.
Cr. D. F. F. Granter, J.P Cr. E. H. Wagstaff, J.P.
Cr. F. M. Julyan, J.P. Cr. R. H. Wallman, J.P.